For many, "1984" has served as a guide to the Trump era. But it is not just the lies and the alternate reality of Trump that has given rise to parallels being made to Orwell’s novel. It is also the fact that his administration threatens to diminish our range of thought. As I wrote on Salon last week, the Trump era is likely to result in massive cognitive fatigue. In fact, unlike the grim world of 1984, the Trump brain rot is far more complex than Orwell’s dystopia. In five main ways the Trump administration, consciously or not, has been threatening our mental capacities. Since Trump’s election progressive activists have placed considerable attention on how to best form a productive resistance to his platform and policies. We have debated the pros and cons of marches and the strengths and limits of uniting around the Democratic Party. but we have given less attention to the fact that any real resistance requires us to be at our cognitive best. Michael Moore recently released a 10-point plan to make Trump toast, but we will all be toast first if we let our brains fry out. In fact, as any political activist will tell you, progressive resistance is all in our heads — in our imagination, our vision, our dreams. Talking back is the quintessential way for kids to show disrespect, but as psychologists explained, it is also a crucial tactic for resisting oppression and developing an independent personality. When faced with a leader who whines, bullies, berates, insults and threatens, we must hone our skills to intelligently talk back. This means that one key skill for us to develop is persuasive and effective argumentation. The more that members of the Trump administration act like petulant toddlers, the more we need to marshal our cognitive ability to offer rational arguments. But talking back should take multiple forms and in certain contexts the best talking back includes sass, snark and sarcasm. We have often heard the phrase “Sarcasm is the body’s natural response to stupid.” But it isn’t just a response to stupid; it's actually a marker of intelligence. Michael Moore has talked about the political value of using an army of comedy to bring down Trump. As I have also argued we have ample evidence to suggest that political satire and comic resistance can have tremendous political impact. The value in using satirical comedy to deflate Trumpism is even greater than its external political impact, though. Practicing satire and using irony can make you smarter and more creative. Research has shown that the use of irony has positive benefits for critical thinking. And as Srdja Popovic explained in "Blueprint for Revolution," using laughtivism for nonviolent protest encourages creativity. So whether you create satirical graffiti like Banksy or come up with a sharp pun, there is conclusive research that indicates that humorous people are more intelligent. This means that one of the smartest ways to deal with a political gasbag who speaks at a third-grade level is to make fun of him. Research on ways to defend the brain from dementia and Alzheimer’s disease correlates with research about how to survive the alienating effects of authoritarianism: Both approaches say that for the mind to thrive we need to socialize and develop affective relationships. A number of studies indicate that maintaining strong social connections prevents cognitive decline. We also need to move. Whether we run, walk or dance, studies show that physical activity also helps keep our minds nimble and active. All this helps support the intrinsic value of marches and other forms of nonviolent public protests in enabling us to move and connect with a larger community. One thing remains clear: A key way to stay sharp and mentally savvy is to get out of our heads, by opening our hearts and getting off our butts. Much of the research on developing, strengthening and maintaining cognitive ability concurs that we need to constantly seek new ways to challenge our minds. Playing games, doing crosswords or Sudoku or puzzles are all standard recommendations to keep our minds active. Given our current reality, where we are constantly wondering whether the Trump team is stupid or lying, this takes on a new level of relevance. I keep waiting for a revised Trump-era version of “Cards Against Humanity” to come out. Dennis Kravetz has suggested taking classes at a community college, learning new languages or visiting historical sites or museums as further ways to keep a mind active. With Betsy DeVos’s plans to gut public education and threats to defund NPR and strip support for other public-sponsored culture, these activities become more important than ever to support. And then there is the possibility that Trump’s family history of Alzheimer’s disease and his advanced age may well be playing a role in his own cognitive decline. We know Trump doesn’t read books. Samantha Bee wonders if he can even read at all. Trump doesn’t even master English, let alone another language. Despite Trump's repeatedly telling us that he has a “very good brain,” he apparently does not do even the simplest things to take care of his own mind. If we want to avoid being like him, we should play as many productive mind games as possible. Experts on keeping your mind strong and sharp also agree that we all need to be good at resting. Stress, depression and insomnia are some of the biggest threats to cognitive health. There is already significant proof that Trump is increasing our nation’s anxiety and depression. Taking that seriously and getting help is essential to keeping our minds strong. 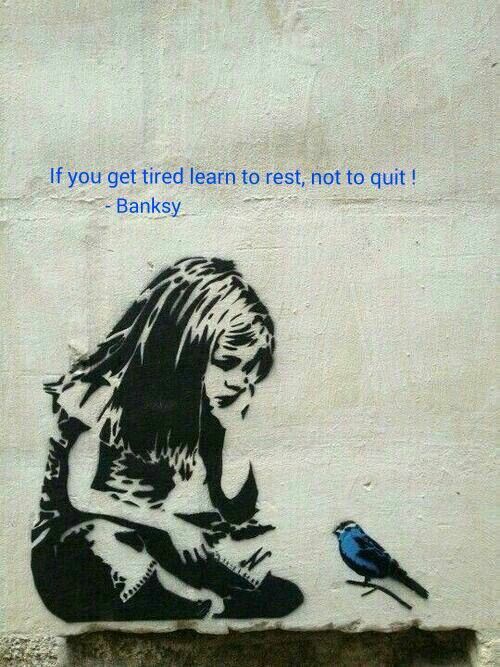 One of Banksy’s famous images is of a girl looking at a bluebird with a caption that reads, “If you get tired, learn to rest, not to quit.” It is a valuable motto to keep in mind for a long road of resistance, one that may well last four years, if not longer. In another article in Psychology Today, Neel Burton explained that swearing is extremely good for the mind. It reduces pain, helps give us a greater sense of control, serves as a form of nonviolent retribution and helps us build fun bonds with our peers. Another scientific study has shown that people who swear are smart. Angry swearing helps us sharpen our minds, build our community and activate the mental joy of humor. All actions that help defend our brain against the dulling effects of Trumpland. This all means that an angry, well-timed swear may be the best antidote to Trump era brain rot. In fact the collective Scottish Twitter response to Trump’s idiotic comment won the nation's tweeters a Tucker Award for Excellence in Swearing. So if all of the other tips I have given you for keeping your mind sharp and protecting it from Trump brain rot fail, try angrily swearing. In fact, why not start now by leaving your favorite Trump swear in the comments below?